Hey everyone, hope you are doing well and are blessed AND enjoying life. Have you ever had one of those days where you’re just looking through encouraging Facebook statuses regarding God, and just thinking if you had said exactly the same thing, you would receive A LOT less likes? Or seeing pictures of individuals doing God’s work, with comments of praise from their friends and family. And then you take a glance at your Facebook wall, and see hardly any comments. Just thought Andy Mineo ‘Superhuman’ song expresses the point I’m trying to make here concerning comparison from 2:54-3:02 lol http://youtu.be/7BF88Y4i1Vg, but I’d encourage you to listen to the whole song if you have the time. Sometimes this can leave you asking yourself ‘What am I doing wrong?’, or leave you with thoughts such as ‘I am less of a ‘good Christian’ when compared to so and so’. Well I am here to tell you DO NOT COMPARE YOUR LIFE WITH OTHERS. 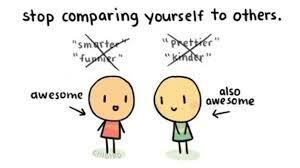 Comparing yourself with others can lead you to developing feelings of self-pity, envy, jealousy, bitterness and so many other sinful feelings. Also God loves us all equally so there is nothing you can ever do to make Him love you more or less. First and foremost I would like to tell you that whatever you do for the kingdom of God will NEVER go unnoticed by God. God see’s your heart and we surely reward you, once you are doing His work with the right heart and with good intentions (desiring to do things for the glory of God and God alone). Also remember that God will always acknowledge those whose hearts are FULLY COMMITTED to Him (2 Corinthians 16:9). So do not feel discouraged or feel that if you are not part of a so called ‘elite’ ministry then your work for God is not valuable. That is a pure lie of the enemy. God needs people to work in smaller communities and churches. If everyone served at big churches who would be left to serve and minister to those in smaller communities or unreachable areas, and vice versa? As Paul mentions every part of the body is vital, do not look down on the work or responsibility God has given you. If the eyes said to the body I want to be like the legs or said i no longer need the rest of the body anymore, how would the body function (1 Corinthians 12:14-31)? We need to learn to be humble, this is especially essential for cases where God calls one into a different area of ministry. If we feel that we are too big to help churches in poverty stricken countries, or it is not in our nature to help clean or set up at church, there is a SERIOUS problem somewhere. So please please please never look down on your responsibility or someone else’s. Also when you constantly compare yourself with others, you can end up embarking on journeys which God has not planned for your life. This can lead to multiple unnecessary failures, loss of valuable time and wasting of money. Ecclesiastes 6:10 states ‘Everything has already been decided. It was known long ago what each person would be. So there’s no use arguing with God about your destiny’. You may also notice feelings of lack of satisfaction if you try and go against the pathway which God has set out for you. You may never find joy and contentment as you will not be doing what God created you to do. Ministry is not about building your own massive empire, but about being available for God to use you as a vessel to win souls. Proverbs 11:30 states that ‘He who wins souls is wise’, so go out there and be fishers of men (this includes all of humanity so women and children included lol). I from experience know that there are many individuals who preach out of envy and jealousy, I mean even Paul speaks of this in Philippians 1:15. Yes the good news is still spread, but with the wrong motives. We all have the same purpose as believers, and that is to win people for Christ through the power of the Holy Spirit. As Paul states ‘The one who plants and the one who waters work together with the same purpose. And both will be rewarded for their own hard work ’ (1 Corinthians 3:8). So avoid turning things into a competition, forget all that ‘my church is more powerful than yours’ and ‘oh I can only feel the Spirit move at so and so church, cos the choir be nailing every note on point.’ Just remember that it is the same Spirit which gives the different gifts to those within the body of Christ (1 Corinthians 12:4). Well enough of that said, in all honesty I just want every single believer out there to feel encouraged. Keep doing the work God has called you to do, it may not be a smooth journey but keep relying on God almighty. Do not look down on what God has called you to do, because that is what you call being prideful, whether you believe it or not. And finally if you do not know what your purpose in life is…. ASK GOD!!! He is the potter and we are the clay, therefore He knows us best, and would be the best person to ask (Isaiah 64:8). God bless y’all, you are all SO SO PRECIOUS (remember that).